So we finally met up with Emanuele at the apartment after the ceiling incident of which he was aware. He found it incredibly amusing that Josephine (the one with the key who showed us the damage) only really wanted him to pay her 10 euro to clean up the dust. And even more amusing was that our downstairs neighbor came to him complaining about the construction and that she was going to the police. Emanuele explained he had all the permits. You may remember this is the same neighbor who called us banditos when we were trying to determine which meter was ours. She went to the police that day as well. 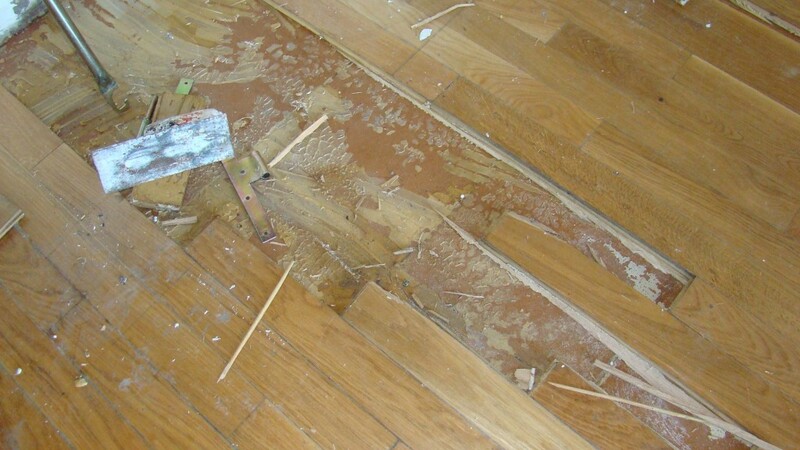 After Emanuele explained he had the permits she asked about the floor in the kitchen which he had torn up. Turns out she was just trying to shake him down. She asked him to give her the wood to burn in her fireplace and she wouldn’t go to the police! He was fine with that so everyone is happy. And laughing. Here is a picture of the pasta I made last night. It is called Bucatini number 9. It is fat spaghetti but it’s hollow! Very popular here and I like it too. Today we went on a day trip way down to the southern tip of Umbria to a Roman ruin called Carsulae from the 2rd century BC. 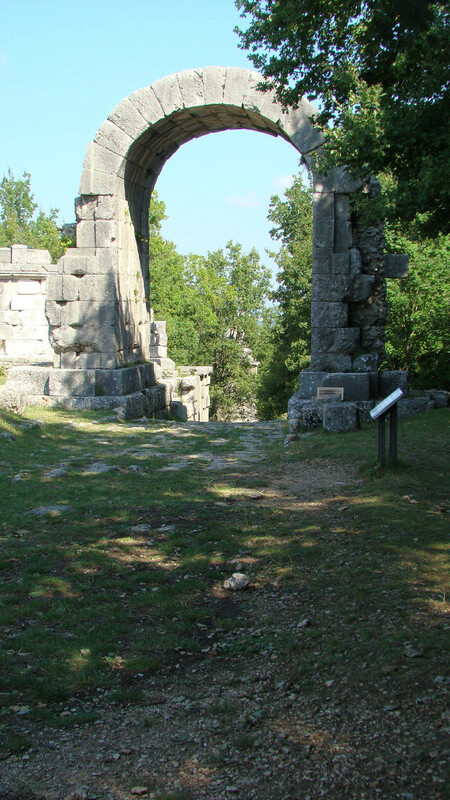 There is a road called the Via Flaminia that runs from Rome to Remini. It is long! 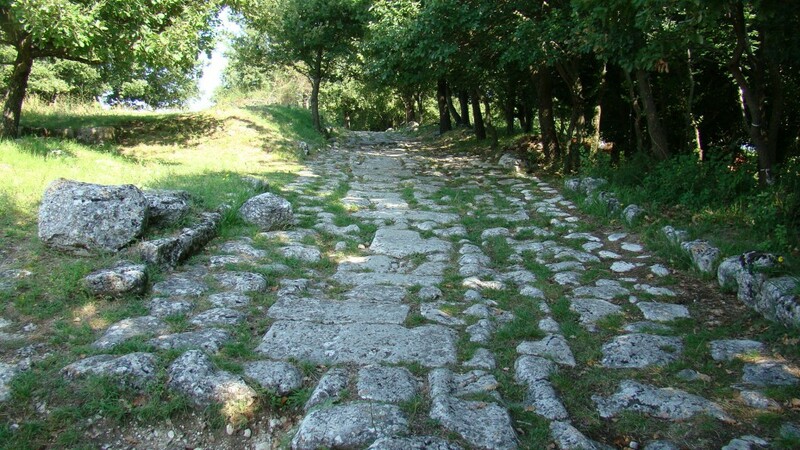 The Romans built that road. There are highways that run it’s route today. 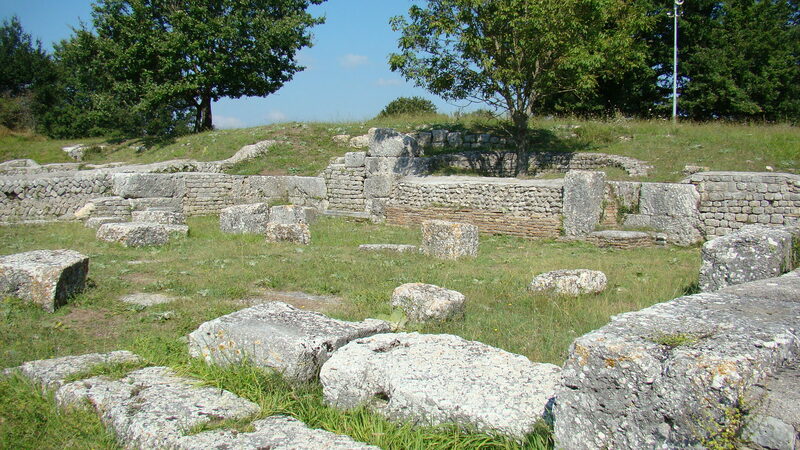 This ruin contains a small portion of the original road along with ruins of a town with a theater, forum, and amphitheater. Here are some photos. This is the road, it even has curbs and gutters and you can see the worn places where the cart wheels rolled. 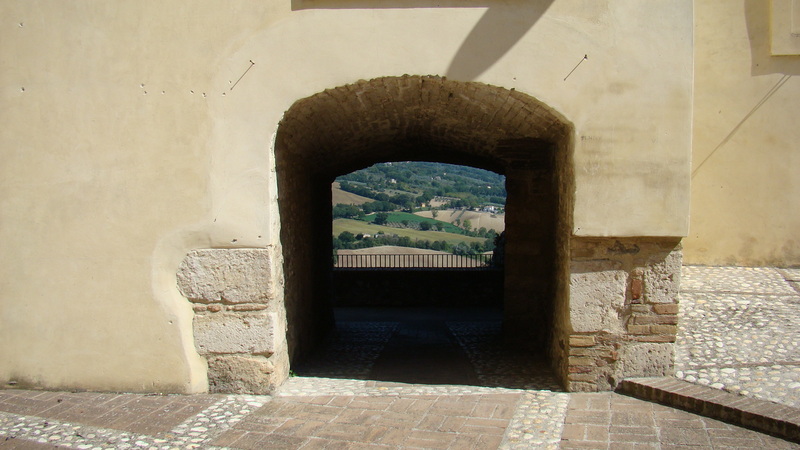 The archway entering the town. Still standing; no mortar! What’s left of the forum. We were looking for lunch and were near a town that the books said was one of the prettiest in Italy, and that’s saying a lot! San Gemini is the town. Up on a hill. We did indeed find a nice little restaurant inside the walls called Taverna del Torchhio. We sat outside. It was a beautiful day with light breezes, perfect temperature (finally) and blue skies. I had the beef carpaccio with arugula and cheese and then orecchietti with pesto and a cheese I was unfamiliar with. Luther had panzanella – the typical bread salad and then roasted lamb. All very good. Here is the view from our table. Here are a few pictures of the beautiful town. The first is a little walkway along the walls. The next is a 11th century church, then the courtyard outside the church and finally a passage through to the walls with the view over the valley. As I mentioned we are in the middle of the band festival. 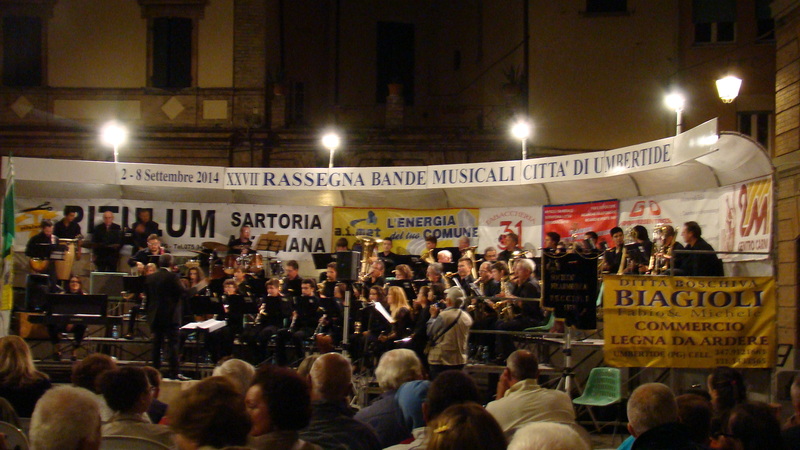 Last night we were treated to an orchestra with a rock group from Pisa. They even had a man and a woman who danced. It was all very wonderful. The guitarist, bass and drummer in the band were some of the best I’ve ever heard. We actually went out to the piazza to watch. Here’s a picture. 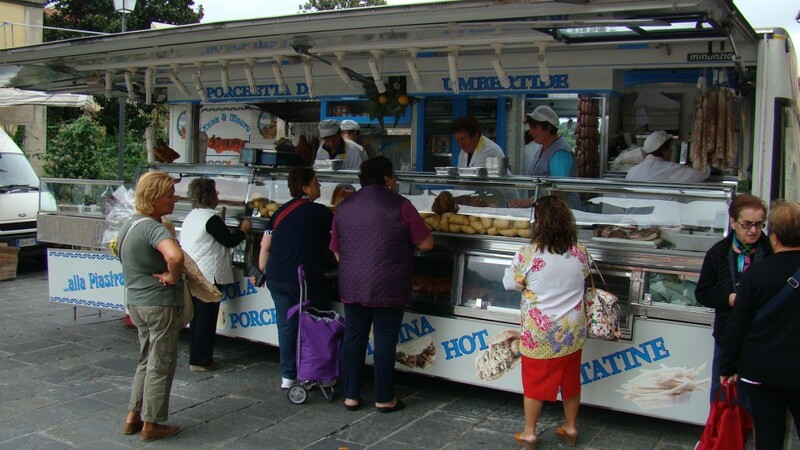 This entry was posted in Eating, everyday life in Umbria, geometra, Uncategorized on September 7, 2014 by Nancy Hampton. A lot has happened in the last couple of days. Yesterday morning I said we were headed for Perugia. We left and it was pretty sunny but by the time we got there it had gotten blustery and cold with glowering skies. It did not really rain though, just spitted a few times. I need to get some warmer clothes! We were headed to scout out the MiniMetro. We found it with no problem. It is small with only 6 stops and goes from the bottom of the hill near the stadium to the very top of the hill town in the center. We purchased our ticket and boarded. It’s fun to watch them operate. They attach themselves to a continuously moving cable. When they reach a station they unhook and small tires convey them to the platform and stop. Then they propel them forward until they hook back onto the cable. They run about every 2 minutes so no waiting. They reach the end of the line then spin around on a turntable and go back. Very steep trip up to Perugia. Takes about 15 minutes to go from end to end with free parking at the bottom and it drops you right at the top in the center of town. Arriving in the center on a spectacular overlook of the countryside from up there we head up just a short way to the main area of town. We visited two churches. First was Chiesa di Filippo Neri. 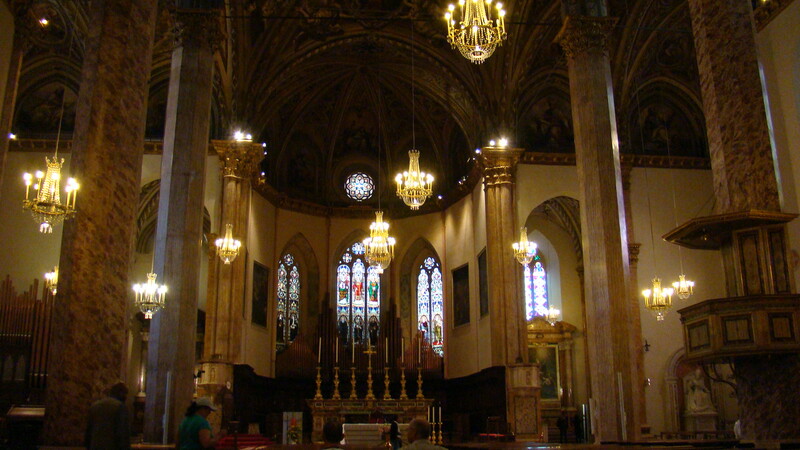 I had heard it was incredibly ornate. And it was. 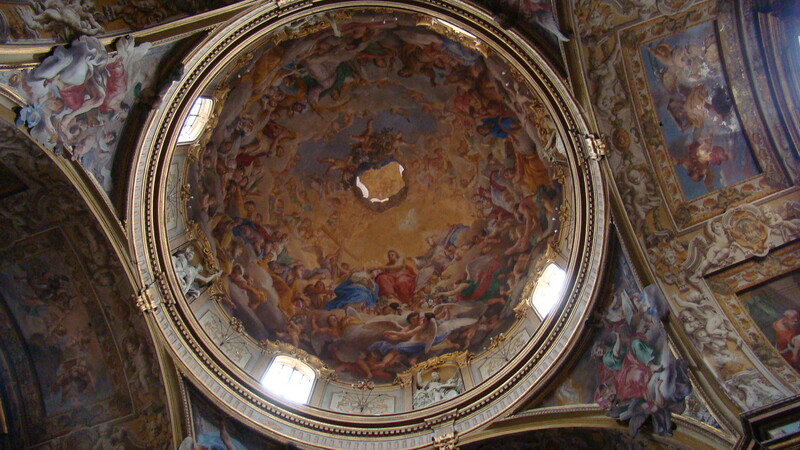 I was sorry to see huge cracks in the domes which could have just been in the frescoes, but who knows. 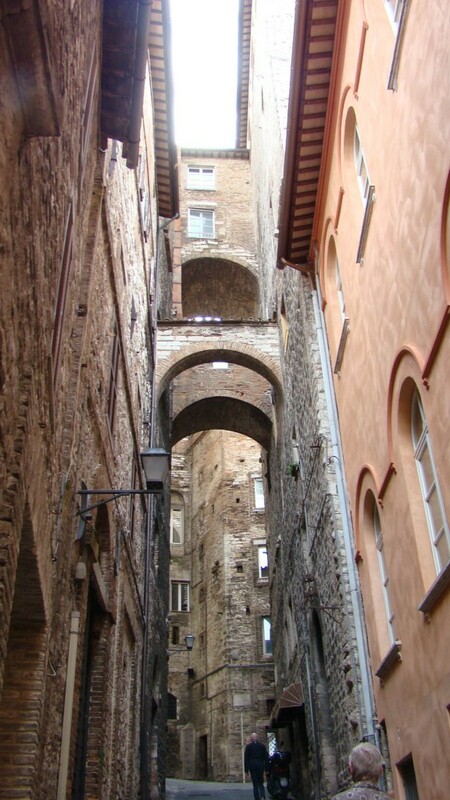 We walked up the steep narrow streets. It is really a beautiful town with hundreds of tiny, almost cavelike streets. We visited the Duomo, or the main cathedral. It was enormous. 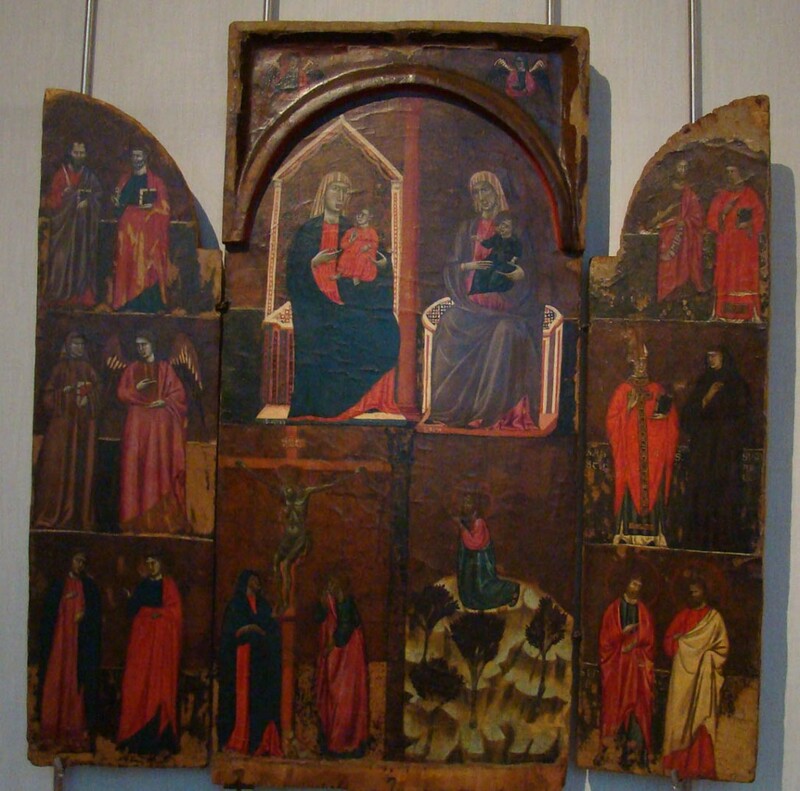 Then we visited the National Gallery of Umbria. If you want to see pre and renaissance art this is the place to go. The works start in about 1230 AD and work up to the 18th century. It is almost all religious in subject matter. 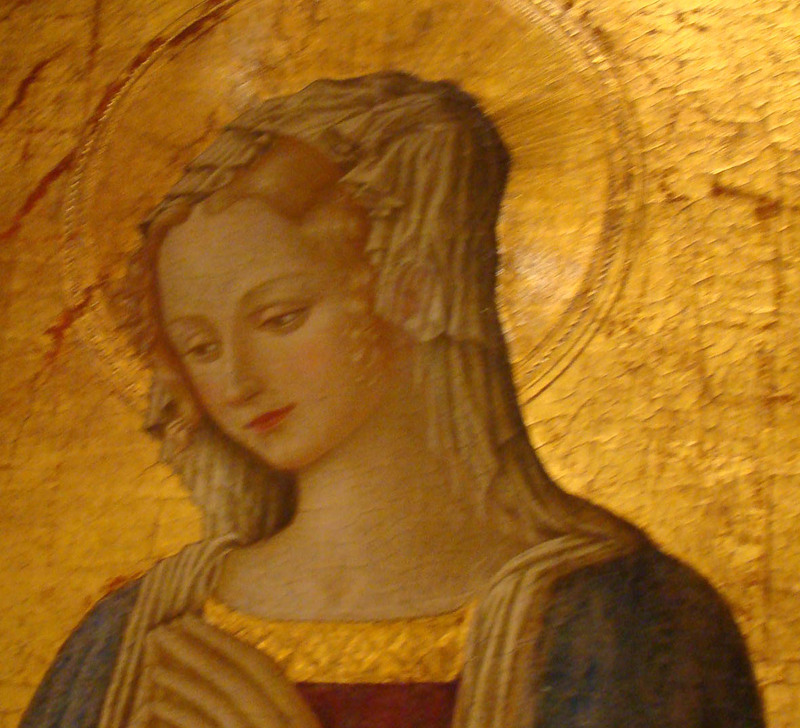 Many of the works were beautifully rendered, the colors vibrant. But it was all meant to scare the crap out of the people. Their lives were dominated by the church. I never saw as many “Adoration of the Christ”, “Escape to Egypt”, “Annunciation”, “Cruxifiction”, “Flagellation of Christ” and “Christ going into Heaven” as I’ll ever need to see again! The subject matter varied little. The saints changed over time. I did enjoy it, but I was very done at the end. 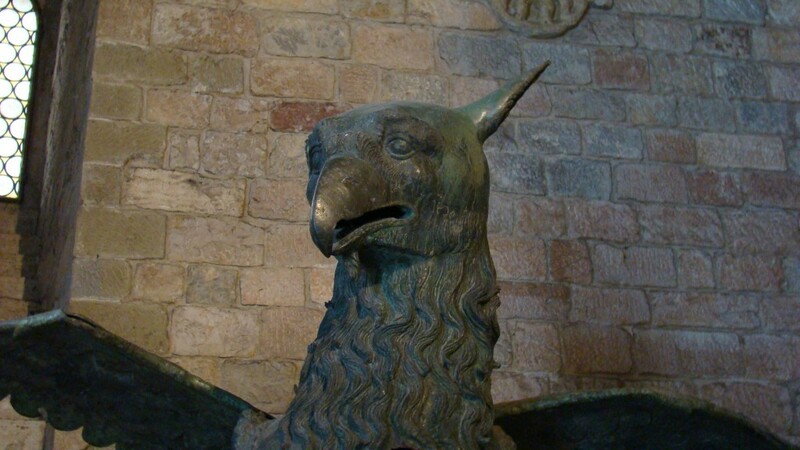 The first picture is the Griffon which is the symbol of the city. Reminded me of Buckbeak for any Harry Potter fans out there. We spent 2 hours in the museum! Then headed out to find lunch. We tried two of Luther’s recommended ones, both were closed, either for good or for lunch that day. We fell back on Da Cesare where we had dined with the Gang on our last trip to Umbria. We ate inside since it was so cold outside. The food was classic Umbrian and we split a mixed Bruschetta antipasti and both had pasta. It was good. Since we returned we have gotten a good recommendation for our next trip for Bottega del Vino from our friend John in Montone. It sounds great and we look forward to trying it. 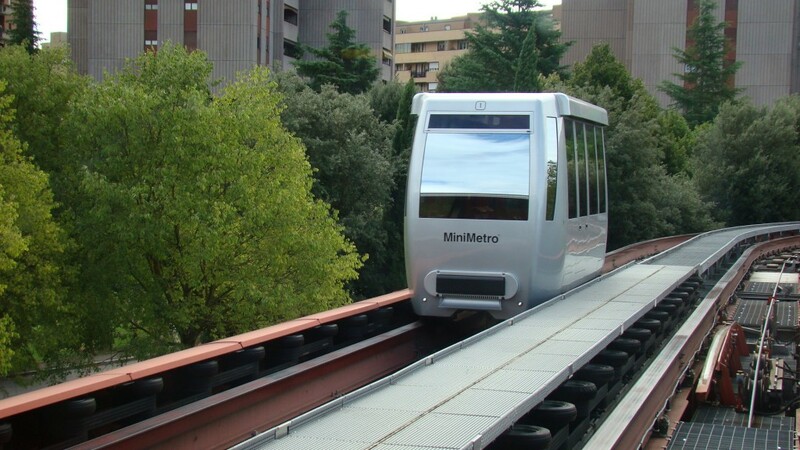 We headed back on the MiniMetro and then home where we had a meeting with Emanuele at 4:30 at the apartment. We met up with him and his partner Paolo and the Electrician and the Plumber. I had sent a rather curt email in the morning about the fact that the sofa was STILL uncovered which may have lit a little fire under him because they covered it while we were there. We had discussions about the pantry space. It will be a nice big space and he has good ideas for shelving across one whole wall and then on the otherside for part of it. We explained that we wanted some floor space dedicated to the cats which is always a priority. So all is well at Via Grilli – for now. Today we did a bunch of errands. 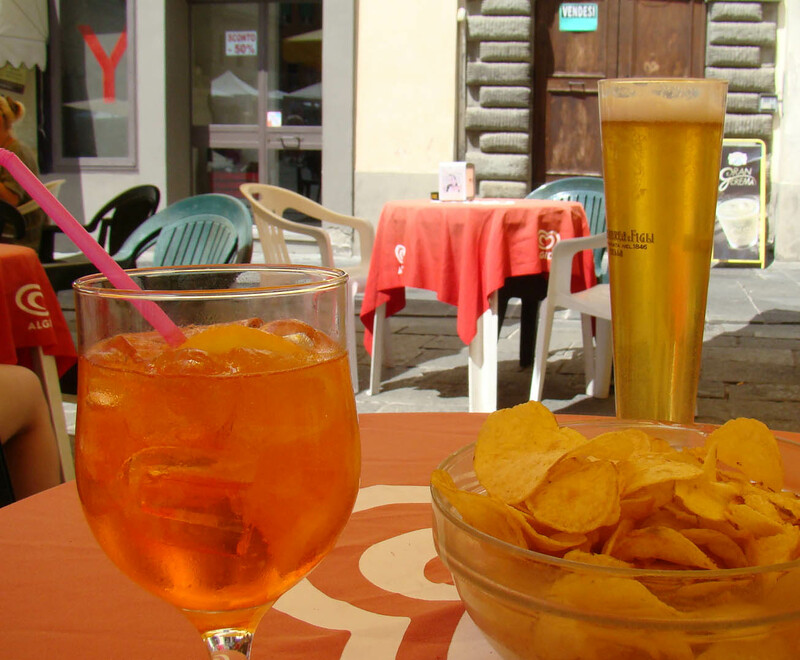 We first had Cappuccini at Bar Mary and did people watching at the market. Then I did my shopping to include tomatoes, potatoes, onions, arugula, and those red and white beans that are so good. Look at all these peppers!! Then we got our porchetta pannini. That stuff is like CRACK! I thought about it all week since last Wednesday. This time Luther didn’t make the mistake of not getting one. 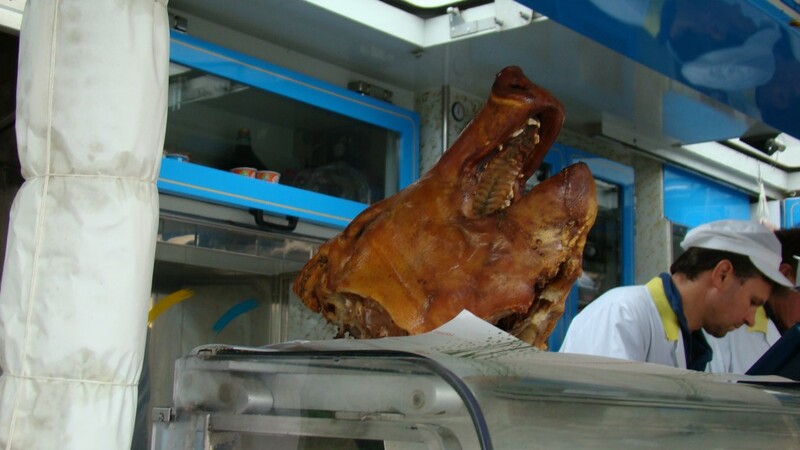 Don’t you love the pig face!? Poor pig but I have to see he was much appreciated in his final form. Next we hit our favorite seafood stand to buy fish for dinner tonight. We got whole sea bass to try. We headed to the bank next to put down a 50% deposit on the lighting for our house and dropped it off at Emanuele’s office with Paolo. Whew! all done and glad to get back to the apartment to eat our Panini, get out of the cool weather and read a bit. 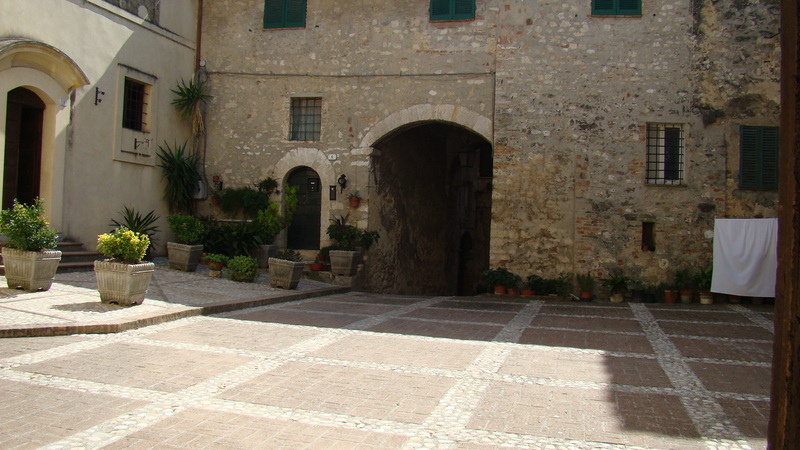 This entry was posted in everyday life in Umbria, geometra, House renovation, shopping, Umbertide, Uncategorized on September 3, 2014 by Nancy Hampton. There hasn’t been too much happening. Just odds and ends that I’ll catch up on. We spent a couple of quiet days. We caught up over lunch with Susan and Gary who had been in the Dolomite mountains in the Alto Adige part of Italy. It used to be Austria before the first world war. They still speak primarily German and it is Germanic in feel. We have been several times. It was not their cuppa tea! Also they had a lot of rain which was unfortunate. We met with Emanuele and he “says” he is all set to start work on Sunday. I am excited but not holding my breath. He also brought us a letter from Fed Ex. This was our next challenge. We had arranged for Luther to get his prescriptions sent to our Texas mailbox. They showed up last Friday. I arranged for them to be sent to Emanuele’s address as someone is always there. The letter he brought was from FedEx regarding customs who want to know exactly what is in this package. We had been expecting this. They emailed us a bunch of forms and we filled them out. We had to go to the bank to arrange to pay the €40.00 they charge. We could have gone to our bank website to do this but the site was down. We only had 3 days to get the funds there so opted to go in person to the bank. SO we sent the money and filled out the forms and sent them all back. We hope this will allow the medicine to be delivered. This whole thing is costing a good bit of money. First the prescriptions cost around $30.00. Not bad. Then it cost $56.00 to sent them via FedEx. This was the least expensive method that was trackable. Add to that the €40.00 (about $52.00). At least we only have to do this every 3 months. Once we are registered here we can get the Italian health insurance. That will be a WHOLE other experience! So we congratulated ourselves with a trip to the restaurant across the river today with a nice lunch all’aperto. As an added little factoid – in Italy never ask to dine al fresco as we do in the US. This means literally “in the cooler” or in jail!! HA HA! We have two upcoming events. One is a tour of Umbertide Underground! It is through the wine club and is next Tuesday afternoon. Apparently Umbertide is honeycombed with tunnels, catacombs, old wells and cantine. 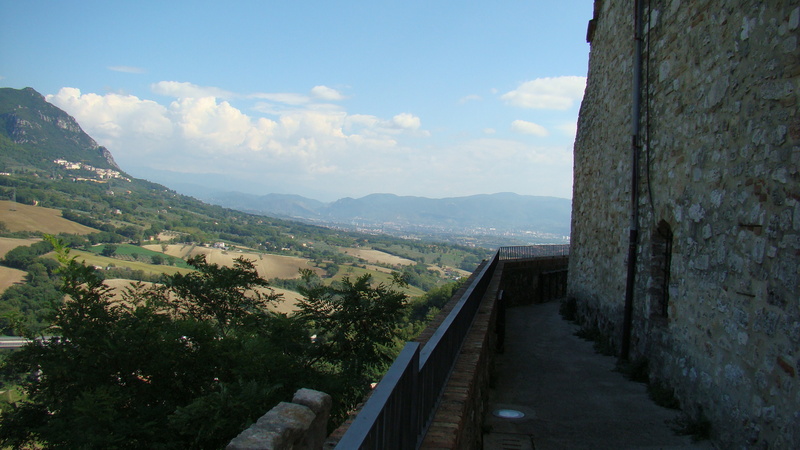 We will get a guided tour and tour La Rocca which is the big castle built into the town walls. 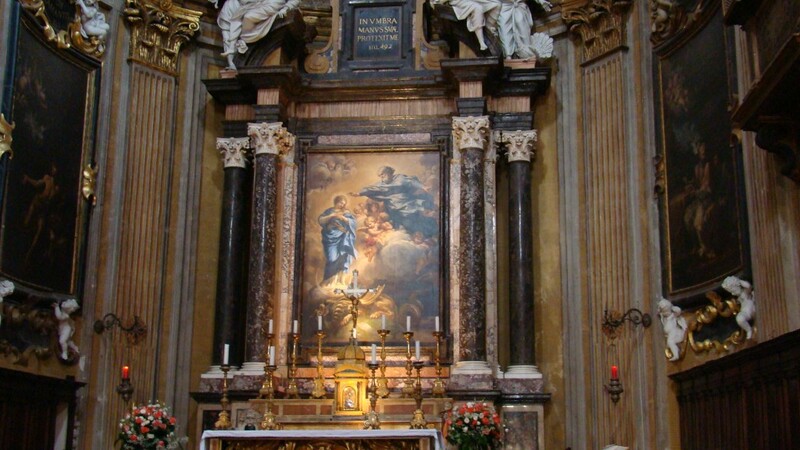 The other is a concert in the Chiesa de San Francesco on Saturday evening at 7PM. The church was built between the 8th and 12th centuries. The concert will be a 50 piece orchestra playing Brahms. I am quite excited to see this. This entry was posted in everyday life in Umbria, geometra, House renovation, italian paperwork on August 21, 2014 by Nancy Hampton. Wednesday. Not a lot to report. A beautiful day after thunderstorms last night. Today was market day and I don’t think I’ve ever seen so many people. I think many of the summer residents are here now and of course the market would be a big draw. I went out early to buy produce, which is beautiful and bountiful right now. Also two whole trout from the fish monger and some little tiny clams. We will have them tonight with linguini. Monday we met with Emanuele and gave him the list of what we want and what we don’t want. Va bene. All is well. We cut about 1/4 from the costs. Our sofa was delivered yesterday. I hid in the house while Luther went to deal with the delivery men. Why? Well because the sofa is BIG. And the stairway is narrow with an inconvenient U turn with a low ceiling. I wasn’t at all sure it would fit. And it was a very near thing Luther said. But in the end our sofa is there! And it looks great and is SO comfy. 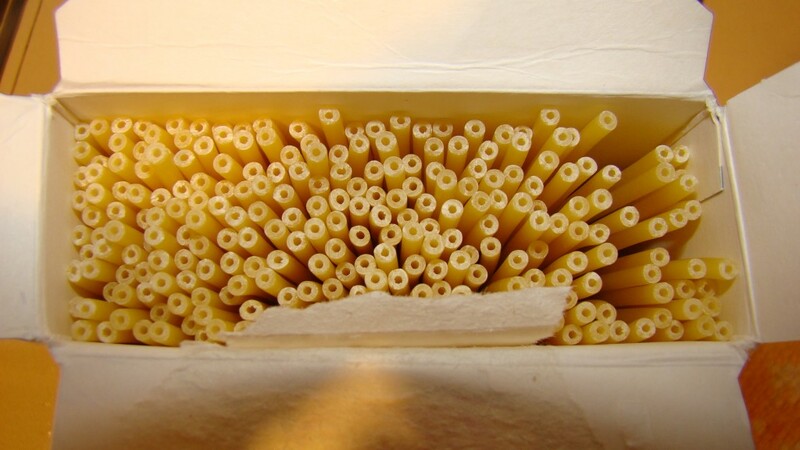 Today we got confirmation that our wire of the deposit reached Pedini. Also Roberto from Pedini came and he and Emanuele proceeded to measure precisely for the kitchen. All good. It means things have begun. Emanuele will begin work soon. I imagine he will start with the removal of all the stuff like the old kitchen, the attic debris, kitchen floor, etc. This entry was posted in geometra, House renovation, Uncategorized on August 6, 2014 by Nancy Hampton. So on Wednesday evening we met with our Geometra, Emanuele with Susan in tow to translate if necessary. Emanuele had a line item list of costs for the things we want done. To be short, it was a lot more than we want to spend. So we took it home to decide what we want to do and what we do not “need” to do. We went over to the house and looked at each item. All the kitchen, pantry and patio stuff are important to us so we will do those. Also having the floors cleaned and refinished and all the walls painted. Lighting is also important but we had already whittled that down from the “everything you could EVER possibly want” to what we “actually” wanted. The initial estimate was €10,000. We got it down to under €4,000. The things we cut out of the budget were mostly in the attic areas – there are two of these. The areas are very large, great for storage. The estimate included painting the spaces and tiling the floor which we pretty much nixed. We are OK with them cleaning out all the old stuff left up there. I am thinking we can just take a couple of cheap carpets up there to cover the crumbled concrete floors and still use it for a lot of storage. We will still have them put vent windows in to release the heat up there and replace the small windows that are in each attic. We also discovered we could see down into the kitchen from up there so that needs to be fixed!! Other stuff that we nixed were sealing and waxing the vaulted ceilings and the living/dining room beams. I am OK with them as they are. Also changing the steps in the hall. Emanuele said it would be good to make them more level. Hard to describe. I need to take some pictures. Anyway, in the end you would walk from the hallway onto level area with 2 steps down to the living room and 2 steps down to the foyer. Rather than one down now from the hall to the platform and then one down to the LR and foyer. Just not worth the expense. Long story short, we eliminated about a quarter of the costs so that will work in the long run. This entry was posted in geometra, House renovation, Uncategorized on August 2, 2014 by Nancy Hampton. So today we had a 9AM appointment and made it fine. We were the first called and we each went with a different person. We were fingerprinted and we had all the necessary forms. The two guys we dealt with were very nice. Luther had fun practicing his Italian and got lots of compliments on how well he spoke. They told is in 2 or 3 months we should have our Permesso. OK. At least that’s another hoop jumped through. Yesterday we met with Emanuele and had Susan along as an interpreter as it was kind of technical stuff about the estimates, lights, kitchen, schedule etc. We got the number for the kitchen from Pedini which was about on track with our guess as to cost. The big surprise was that the rest of the work and lighting, tiles etc was much higher than we had anticipated. We are not sure why. Perhaps it is the logistics of the whole job. Emanuele told us they would have to take everything up and down the stairs. He had hoped for a hoist up to a window but that would be too disruptive to the stores below. Anyway. We took the lighting estimate home. It alone was 10,000 Euros but it was also everything and then some. We whittled it down and I think it will be more like 4,000 Euros now. We took the lighting choices and the kitchen choice to Emanuele today and he called the Pedini people who will come to measure everything hopefully next week. He is also going to give us a line item estimate and we will eliminate anything we can to get the price down some. Right now I am thinking the attic area will not be tiled as we had discussed. We can use the space without it being tiled. We will still want the vent windows up there and probably have them clean it out. It will all depend on how much it will cost. We also went to Formica, a big electronics chain who have a store here in Umbertide. Oddly the word formica means ant in Italian! We took Luther’s finally unlocked IPhone and got it activated with a plan for calling, text, and internet access. Pretty easy and pretty reasonable. He now has an Italian phone number. We will keep the little non-smart phone that I have which has a US number in case we need someone to call us from the US. I will use that for my phone. I forgot to tell you that Susan told us about a free app for the IPad or IPhone called DuoLingua. It is a language app that I am finding extremely useful. I have learned a LOT of stuff from it in the last 4 days that I have been using it. I recommend it to anyone learning a language. It is really a lot like a game and that’s fun! 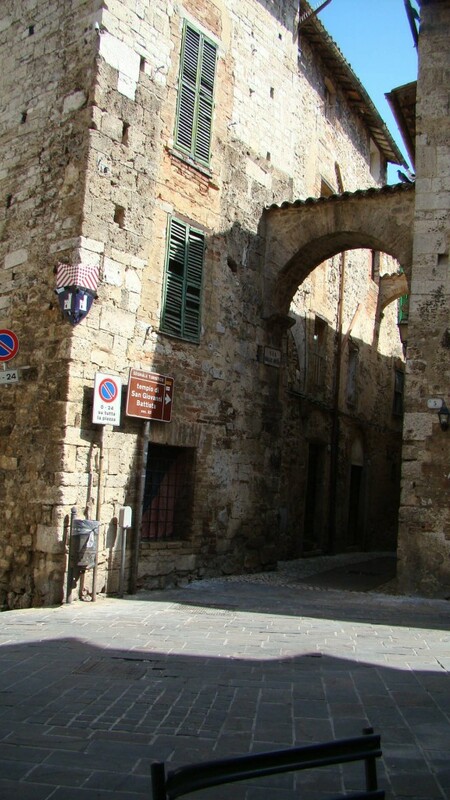 This entry was posted in everyday life in Umbria, geometra, House renovation, italian paperwork on July 24, 2014 by Nancy Hampton. Yesterday was market day. We ventured out and found a few things were different. The biggest truck was missing leaving a large hole in the center. The beer guy was in that spot. Just outside our door was a new stand with piles and piles of garlic and onions. That’s all he was selling. As we strolled around looking at the wares we noticed a tent was set up with only half of it’s leg height extended. It had nothing under it. We finally figured out that the big missing truck and this person were on their summer vacation. I guess the short tent guy must have had someone set it up to keep his spot from being stolen. Ha! So the summer vacations run from mid-July to the end of August. Nothing gets done in Italy during this time. Even the government offices close and the libraries. The produce is really hitting it’s high summer stride now. The tomatoes are fabulous. They just have four kinds. Romas for sauce, normal red ones, cherry and striped ones for salads. No heirlooms. 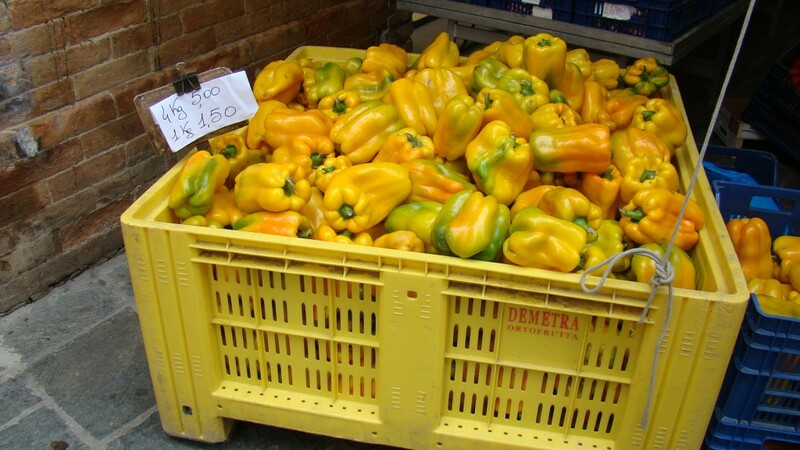 They sell them ripe and nearly green so they keep for a week and ripen. 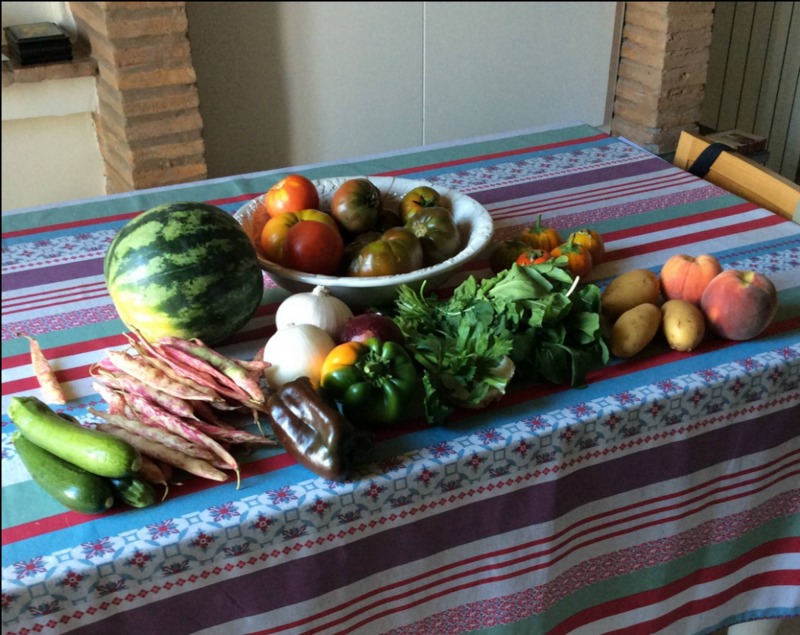 We bought some from the local producer stand – tomatoes, basil, arugula, zucchini, eggplant. A lot of the produce is from far away like Puglia and Sicily. With the makings of a salad we bought two balls of mozzarella di buffala. We bought a quarter watermelon. We bought pecorino cheese. We also decided to try the porchetta. There are about 4 stands that sell it. 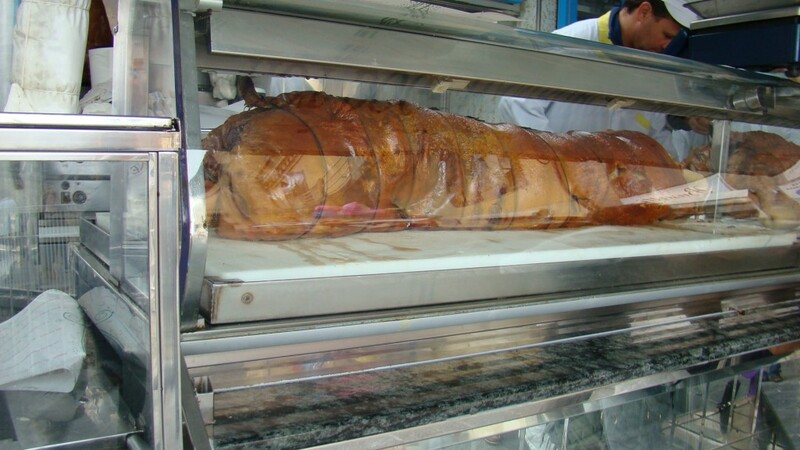 It is a whole pig that is boned and rolled and slow roasted. It melts in your mouth. We got some from each end and a little of the crackling crisp skin. We had it along with the tomato mozzarella salad for dinner last night and it was great. 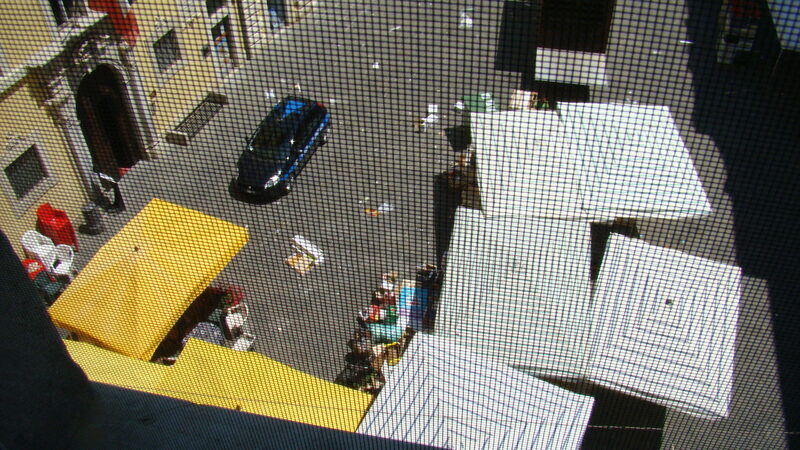 Here is a shot from our window at the aftermath of the market. The screen in the window messes it up but you can see all the trash they leave behind. The town cleans it up. We also met up with Emanuele and the lighting lady. We walked over to the apartment and she and Emanuele discussed his ideas. He had been in the apartment yesterday and tore up some of the floor in the kitchen to see what was underneath. It was good news, tiles. That means the floor doesn’t have to be reinforced to lay new tile over the old tiles. He also had brought samples of 6 different tiles. We chose the one we liked best. He will use a slightly different one for the patio which is more textured so it won’t be slippery. 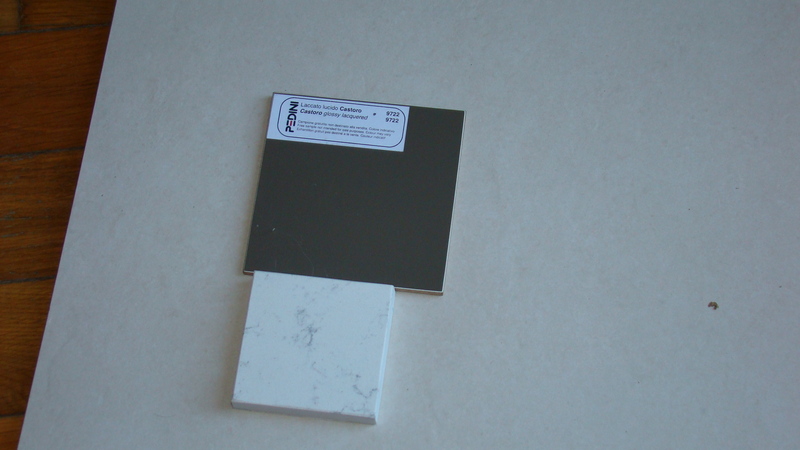 Here is a picture of the big floor tile, the quartz counter top sample and the sample of the cabinet finish. 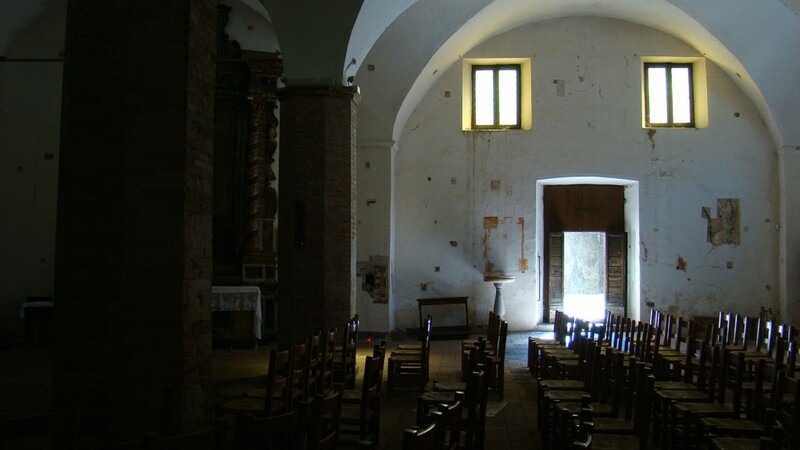 This entry was posted in everyday life in Umbria, geometra, House renovation, Uncategorized on July 17, 2014 by Nancy Hampton.